THE Zimbabwe Defence Forces (ZDF) yesterday announced the end of Operation Restore Legacy launched on November 13, saying the situation in the country had returned to normalcy. The main objective of the operation was to remove criminals that had surrounded former President Cde Robert Mugabe and those who were fomenting an environment that had the potential to lead to violent confrontation. 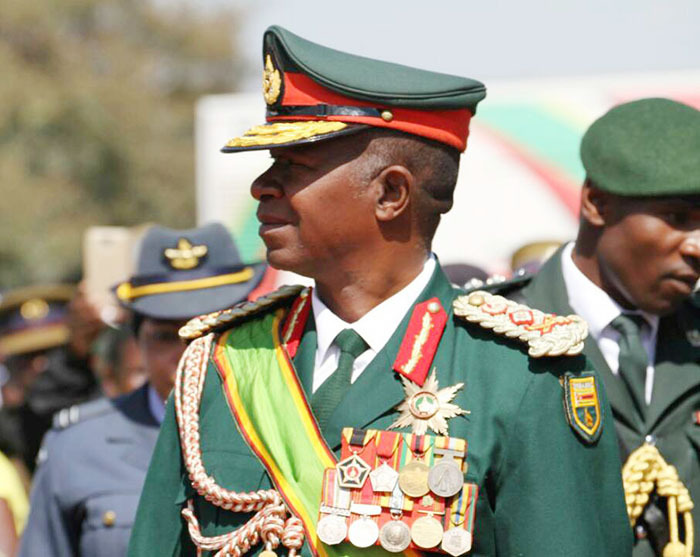 Newly-appointed ZDF Commander General Phillip Valerio Sibanda announced the end of the operation at Josiah Magama Tongogara Barracks in Harare, saying ZDF had handed back all normal policing duties to the Zimbabwe Republic Police (ZRP). “The Defence and Security Services come before you once again to pronounce the end of Operation Restore Legacy,” Gen Sibanda said. “Operation Restore Legacy was launched on 13 November 2017 and its main objective was to remove criminal elements that had surrounded the former President, resulting in anxiety and despondency amongst our people. “While some of the individuals have been accounted for, others skipped the country. This, notwithstanding, the objectives of the operation have to a large extent been achieved. Gen Sibanda continued: “As Operation Restore Legacy comes to an end, it is our hope as your Defence and Security Services that our people will remain united, shun corruption, be law abiding and focus on working hard for the development of our country. “Furthermore, your Defence and Security Services would like to remind all Zimbabweans to remain vigilant and to report any suspicious objects and individuals to law enforcement agents. “This is because some members of the G40 cabal that had surrounded the former Head of State are now bad-mouthing the country from foreign lands where their intentions to harm the peace and tranquillity that exist in our country have been pronounced. It is therefore the duty of every Zimbabwean to ensure that these malcontents and saboteurs and others of like mind are not allowed to succeed. Gen Sibanda thanked all members of the security services who took part in Operation Restore Legacy for their diligence and courteousness when dealing with the public and commitment to duty. He said Operation Restore Legacy had wider implications on political, economic and social activities of the people. “In this regard, a new political dispensation has been ushered-in to take Zimbabwe into its rightful place within the Sadc and the world at large,” he said. “The nation will recall that before the statement that was issued by the (then) Commander of the Zimbabwe Defence Forces, General Constantino Guveya Dominic Nyikadzino Chiwenga on 13 November 2017, many political economic and security events had taken place all of which had the effect of causing anxiety and despondency among the generality of our people, as well as destabilising the Defence and Security Services of our country. “The General’s statement was followed by a series of political events, the highlights of which were the resignation of the former President, Cde R.G. Mugabe from the seat of power followed by the inauguration of His Excellency, President Emmerson Mnangagwa as the second executive President and Commander-in-Chief of the Zimbabwe Defence Forces since the country’s independence in 1980. Since then the appointment of a new Cabinet on 30 November 2017, and the holding of the Extra Ordinary Congress of the ruling Zanu-PF party and many other events are now history which we have been all witnesses to.